Are you a coffee drinker? I’m not. I might drink one occasionally, but it’s pretty rare. Back in the days before I was eating healthy, I remember that I would sometime get an iced coffee from a popular coffee shop in the summer, so when Botanica Health asked me to create a recipe with their organic Golden Mylk, I immediately thought of creating a healthy version for this! 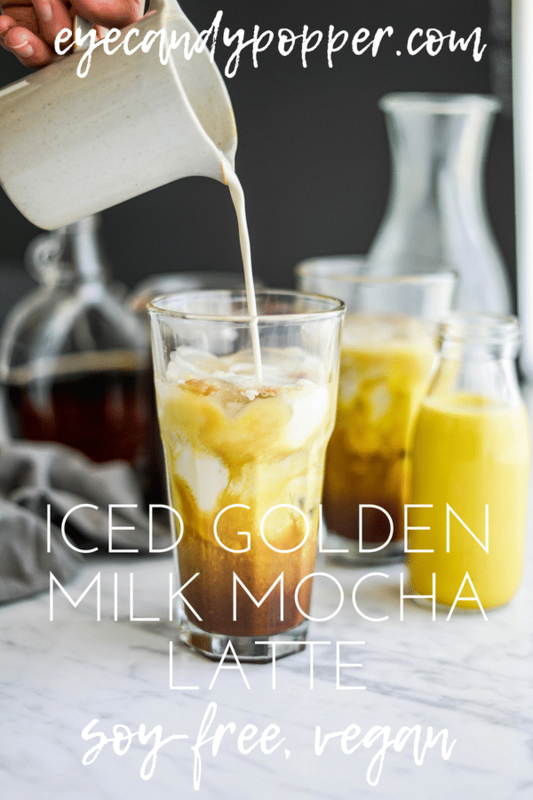 Perfect timing for the summer weather, I made an Iced Golden Milk Mocha Latte for your pleasure, and you can make it with or without coffee. *This post is sponsored by Botanica Health. I received a free product and was compensated to create this post. All opinions are my own. Golden milk is made primarily with turmeric, this amazing spice that contains curcuma and has many health benefits, healing and anti-inflammatory properties that has been used in ayurvedic medicine for centuries. Modern science has caught up and now recognizes that turmeric is pretty awesome! Turmeric has been shown to not only have anti-inflammatory properties (meaning it fights inflammation in the body – which is linked to many diseases), but also anti-depressant, anti-coagulant, anti-cancer and anti-arthritic properties, since it’s a powerful antioxidant. Antioxidants help our bodies to fight against free-radical damage (the stuff that can turn into cancers) and oxidative stress. It’s also shown to be helpful in slowing down the progression of degenerative diseases, and boost memory. 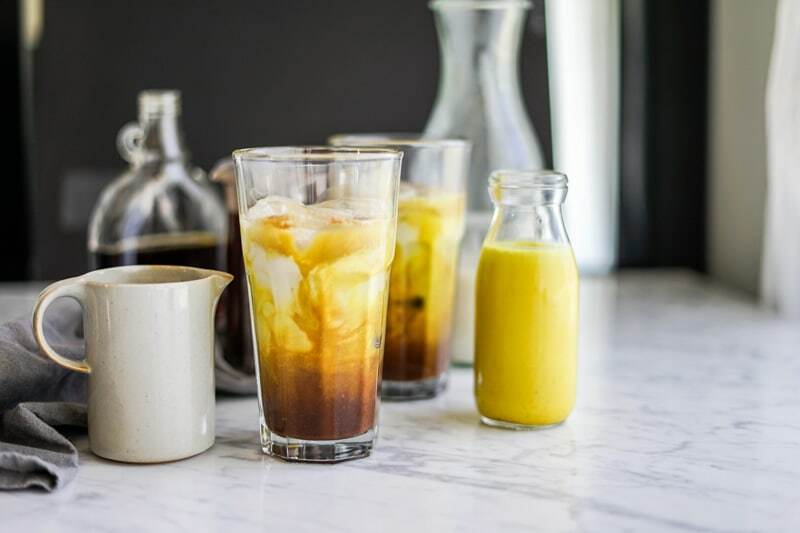 Golden milk goes beyond just turmeric, because as with many foods, its properties are boosted and made more readily bio-available when it’s combined with other foods, such as coconut milk, and specifically when it’s combined with black pepper. 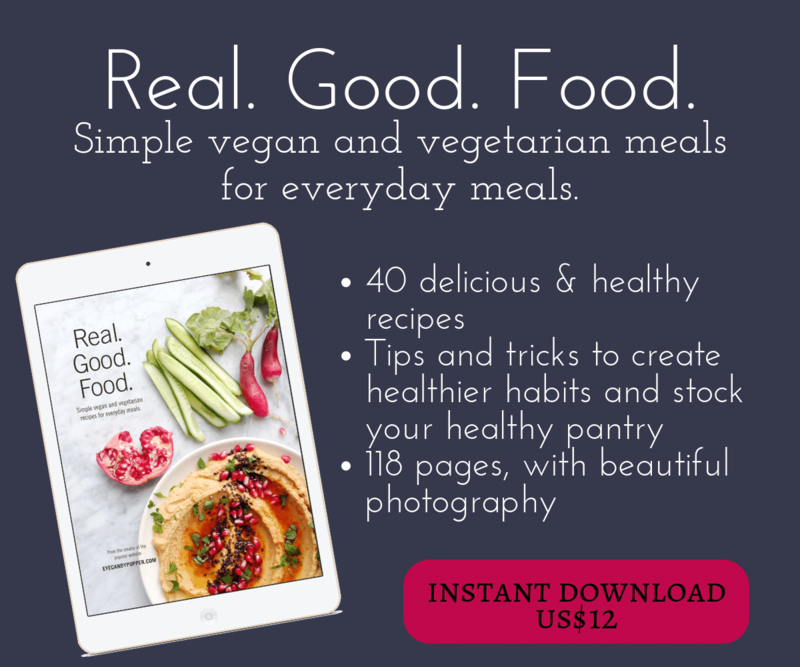 Bio-availability means that your body absorbs it much more easily, makes it easier on the digestion, and processed faster, so you get all the goodness even faster to your bloodstream and more of it. Coconut milk is also anti-inflammatory and contains good fats that are beneficial to our digestive system. 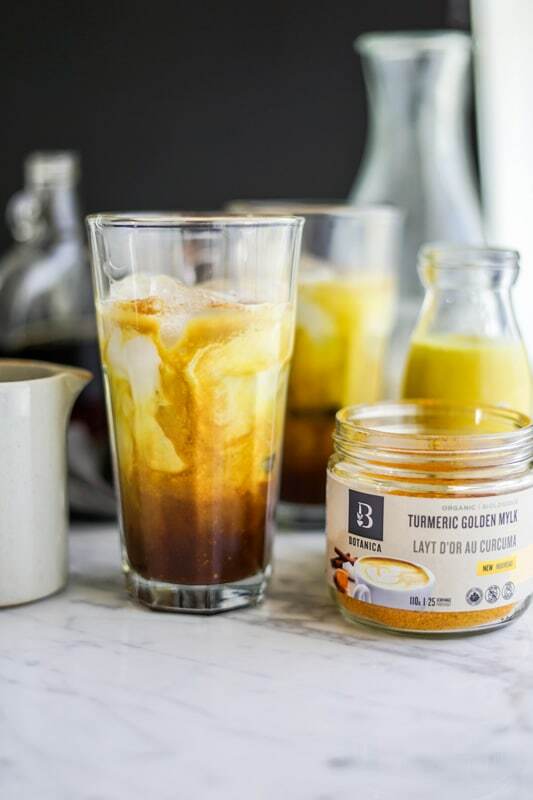 Botanica’s Organic Golden Mylk is made with whole turmeric, coconut and black pepper, but also contains other amazing ingredients, like dates instead of sugar, and ashwagandha, which is a popular adaptogenic herb that helps restore normal bodily function, and resist the damage that stress can cause. All this conveniently available in one jar, and ready to use to make some Iced Golden Milk Mocha Latte! The recipe also calls for some organic cocoa powder to make it easier, but you could also melt some baking chocolate to make it even creamier and rich. I also used maple syrup instead of sugar, to keep it light and add another amazing flavour. You might wonder if the turmeric will taste very strong? I gotta say, I was wondering that too when I got the Golden Mylk jar. I had never tasted golden milk before. I tried it for the first time warm, following the instructions, and I was so pleasantly surprised at how delicious it is! The taste is mild, but it’s so very comforting. I wasn’t expecting much, but I felt a very real sense of relaxation, which was a great surprise! I can definitely see myself enjoying a cup in the evenings, especially when it’s cold outside. But today’s recipe is for summer, although you get all the benefits too! Very refreshing served on ice. 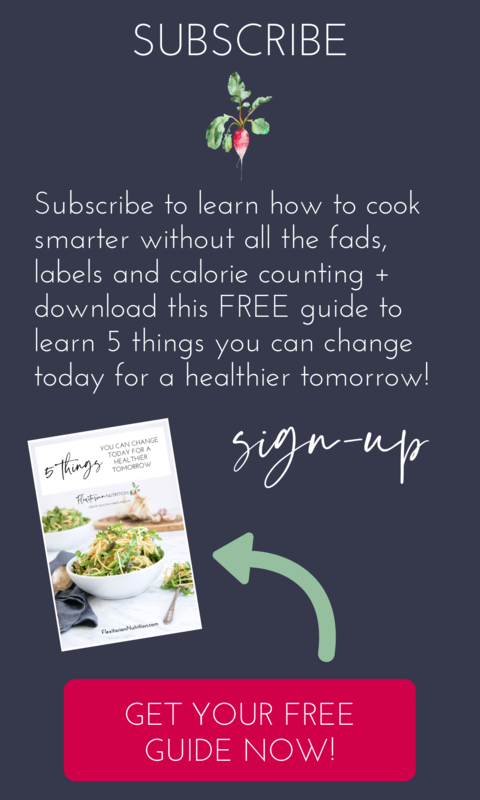 I used a thick creamy version of my Homemade Cashew Whole Milk in this recipe because I wanted it to be thick and creamy, but you could also use more coconut milk if you wish. To make the cashew milk, I used 1 cup of whole raw cashews and 3 cups of water (follow the rest of the instructions in the recipe). This is going to become this summer’s favourite drink! 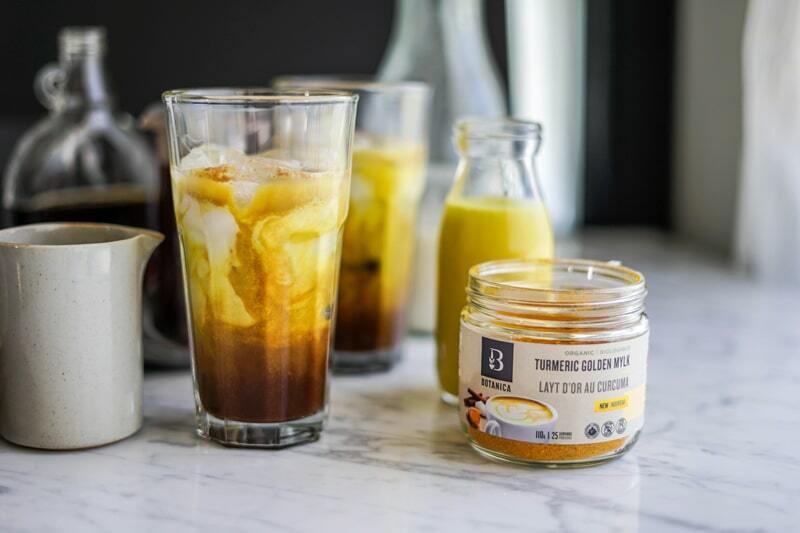 Want to win a jar of Botanica’s Golden Mylk? Check out my Instagram or Facebook page for all the details (contest open to Canadian residents over 18)! 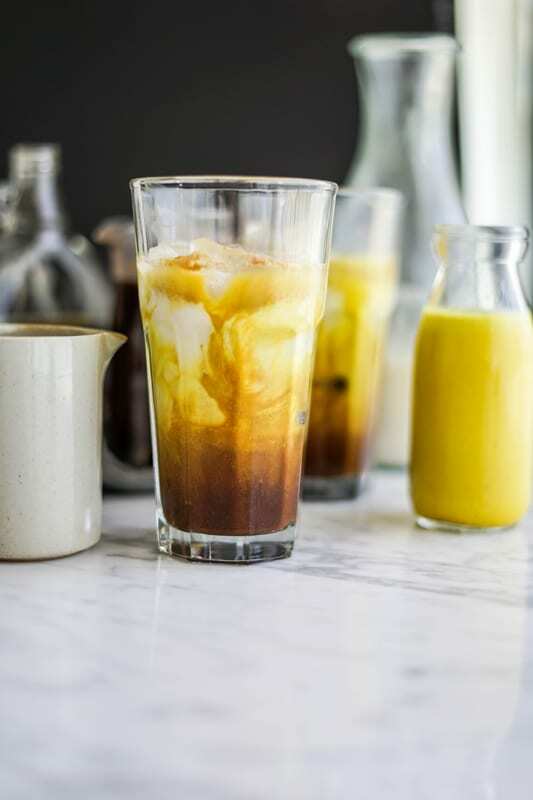 A modern and simple way to enjoy a traditional ayurvedic beverage and all the health benefits from turmeric, in a refreshing drink for the summer! Prepare 1 cup of coffee substitute (or coffee) according to the packaging. Mix in the cocoa powder and maple syrup, and let cool for at least 10 minutes. Warm the coconut milk until the fat is dissolved, then add 1 cup of cashew milk to warm up a bit. Don't overheat! Mix the warm coconut milk and cashew milk with 2 tsp of Botanica's Organic Golden Mylk according to the instructions on the packaging. Let cool for at least 10 minutes. Fill up your glass with ice cubes and pour half of the coffee and chocolate mixture over it, then pour half of the Golden Mylk over, and finally pour half of the leftover 1 cup of cashew milk over everything. Enjoy! This can be prepared ahead of time, so feel free to double or triple this recipe and keep everything in the fridge for a convenient ready-to-go drink. I tried this on a hot day and it was delicious and refreshing! I find it frustrating that you publish this but I cannot get this product in my area or even sent to me by Amazon or Botanica. It would be helpful if you publish recipes specific to a product to check availability before pubishing since I cannot get a hold of this Mylk. It is delicious! Made some with coffee and it tastes great and is refreshing. I’m not a fan of turmeric so I was skeptical about it; but it’s just the right amount of everything. That blend is pretty awesome! That’s awesome, glad you liked it!